Columbia County is about to reapportion political power, free from the distortion caused by prison gerrymandering. An article in today’s Register-Star reports that Columbia County, New York is working on reapportioning local political power to comply with the Supreme Court’s requirement that every voter have a right to equal say in government affairs. Thanks to a 2010 historic voting rights law that outlawed prison gerrymandering in New York, this time the county’s reapportionment process won’t be undermined by the Census Bureau’s prison miscount. Before, Columbia County based local apportionment on total Census Bureau population data, which includes all the people who are locked up in the Hudson Correctional Facility. That gave the community members who live in the Ward that contains the prison an unfair advantage at the ballot box. But no more. The new law solved this electoral quandary by requiring that incarcerated people in New York be counted at their home addresses for redistricting purposes. 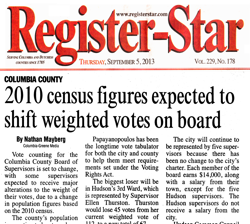 This means that Columbia County’s new apportionment scheme will be based on number of people who are actual Columbia County residents, which, at the end of the day, is what fair electoral systems are all about. Despite the loss of population, Thurston said she agreed with the state law. 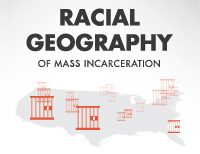 “I think it’s fair that [incarcerated people] be counted in their hometown,” she said. Prison gerrymandering no longer distorts New York’s state legislative districts. When the last of New York’s local governments, such as the City of Rome, finish up reapportioning local electoral power to comply with the law as well, the state will be completely free from the scourge of prison gerrymandering. City of Hudson used prison population to give the residents of Ward 3 about 35% more clout than their actual population warranted. The end of prison-based gerrymandering in New York will finally mean equal representation for the residents Hudson, NY.